Easter Weekend is upon us and our thoughts often turn to chocolate, Giddy Yo is always recommended however, there are a few alternatives. In addition to the Finger Puppets we talked about last week there is a selection of Felt Birds adding a touch of colour to any space, a new pet that is very low maintenance, the soapstone hearts from Kenya, hair decorations made in Canada, Hacky Sacks from Guatemala. Puzzle games from India and so much more. Shopping Fair Trade does make a Difference! hours of fun. These puppets will also encourage their own imaginations and have them telling tall tales to you. These felt puppets are hand made in Nepal. Hamro Village is dedicated to supporting low income and economically challenged artisans by offering them employment. As a result, many of the artisans are able to provide a better quality of life through education, healthcare and nutrition. What a great treat for Easter! As preparation for Easter celebrations get underway we may be looking for new experiences to share with the young or in some cases mature people in our lives. Let us reacquaint you with these paintable pillowcases. They offer a variety of designs and will suit any skill set as the colours you choose are totally up to you. What a great way to spend some time together and have a lasting memory with the added bonus of sweet dreams! It will be so much fun you will want to paint one for yourself! May we present a new member of the Crisil Srl glass family, the dot deco design. Handcrafted in Cochabamba Bolivia from recycled glass. The glass has been collected from local garbage dumps by local companies that in turn sort the bottles before being sold to Crisil Srl. The glass is then cleaned and melted in furnaces by Crisil, the glasses are created and then sent to workshops for the etching of the new design. Currently available in a tumbler, a stemless glass which is ideal for any type of beverage or with a stem that is lovely for a sweet treat presentation. The production chain has helped to improve the quality of life for families resulting in better healthcare and education . Drop in to see them. Stools can be both decorative and functional to any room. Let us introduce to you these stools designed and crafted in Thailand. The perfect size for a little ones to sit on or get up to the sink, sturdy enough not to tip over at first touch. The faces offer a nice complement to any room decor. All hand made and painted come in and see what best suits you. Fair Trade has always supported green. Not necessarily the colour but green in terms of recycling. Fair Trade artisans repurpose what ever they can as shown in the picture above. A few of the times available include glassware made from recycled glass in Bolivia, the garden plant containers made in India from used tires, the oven mitt also from India made from saris, we also have trivets from Viet Nam created from old magazines, mitts from recycled sweaters, leather bag made from goat skin after its natural life and a favourite the plantable card. Come and see for yourself. Friday March 8th is International Women's Day, a day when we acknowledge the contributions , successes and the future of women. Fairtrade embodies all of these qualities. Did you know that Planet Bean Coffee features Cafe Femenino as one of its offerings? This coffee has been developed by a Women's Co-Operative in Peru and has proven to be so successful it is expanding its work to other countries. The Me To We Rafiki Chains made by Kenyan Women have provided them with income to improve their health , wealth, water and education. ideal for those with allergies . The Cheeky Bee Candle does not have any lead, zinc, paraffin or unnatural scents as well as other chemicals found in paraffin candles.. They also emit negative ions that have been proven to clean airbourne pollutants and germs as well as aid in the elimination of odours caused from cooking or our favourite family pet. They also provide great ambiance to any room or table. Cheeky Bee Candles are available in tealites, votives, tapers and candles. The "burn time" ranges from a couple of hours to 350 hours! Drop in and make your selection. Shopping Fair Trade makes a difference! Are you looking to strike up a family music night? May we suggest these musical instruments.The spoons from Thailand add the rhythmn , the large and small drums also from Thailand the beat, the kalimba also known as the finger piano, as well as the recorder and pan flutes contribute to the melody. What a sound you can create when all played together. Can a performance on one the many talent shows be far away? Are you looking for a fun indoor family activity? May we suggest one of these games. Snakes and Ladders, Chinese Checkers or Connect Five each bring out our competitive nature as well as many great laughs. The rules of the games are included however, it is always fun to create rules just for your family. These games have been made by Westcoast Games from a hardwood based composite known as Valchromat. These games are designed to last. We do know that the real fun is just spending time together as a family and creating memories! Valentine's Day is on the horizon. Will you have a special someone to treat you or will treat yourself? May we suggest these lovely summer bags made from Rattan in Bali. Perhaps a lovely silk and cotton scarf from Nepal, a journal to write your thoughts or carry special pictures, a fan just for whimsy or a messenger bag to hold your tablet. Come in and see these and many other ideas. Are you looking for something out of ordinary for Valentine's Day? Why not the gift of relaxation in the form of a hammock or hammock chair. These hammocks have been made by the Oyanca Artesania in Nicaragua. Founded in 2001 by Tamara Pereira who had the aim of providing additional export opportunities for the Nicaragua artisans. The Oyanca Artesania works with artisans from both urban and rural centres and while employing mostly men, women have been successful in joining the group. Benefits from their efforts for the members include being able to enjoy the opportunity to learn new production and business skills. The hammocks are hand woven on simple looms using heavy gauge cotton. Come in see them for yourself. Some days you can never find the right size of basket! This basket or bowl is 50 cm x 16 cm is ideal for bread or fruit for family gatherings or events, toys for little ones, the gathering bowl for lost and found the possibilities are endless! Created by women who live in the rural areas of Bangladesh under the worker-owned Dhaka Handicrafts. The women living in these areas are still not encouraged to work outside the home. Working with this group allows them to not only work from their homes but contribute to the success of their family. As just noted Dhaka Handicrafts is a worker-owned and it markets the efforts of over 16,000 artisans who specialize in making products from jute and other sturdy grasses like Kaisa grass for these very durable baskets. Come in and see for yourself. One of the nicest parts of the Festive Season is receiving cards with news from friends and family. Why wait all year to write a note? A card or a handwritten note are great "pick me ups" especially on gray days. The picture on a blank card can recreate a shared memory or invoke a good chuckle with only a few words that need to be written. Others provide a starting point to write current news or express a note of congratulations, well wishes, birthday greetings or condolences. Our selection of cards is ideal for these sentiments. We feature a cross section of occasions some cards are even plantable. It is a personal touch when you take the time to write a card. Come in and chose for yourself and make a friends day. If hot chocolate is not your favourite beverage how about a hot cup of tea by 4 O'Clock also Fair Trade Certified and Certified Organic. The Roobios which means "Red Bush" in Africans is crafted from the needle like leaves of the Roobios shrub in South Africa. It is naturally caffeine-free and just one of the offerings available. Our last recommendation for a hot beverage is our Planet Bean Coffee, available in Ground or Bean, Single Origin or Blend. Come in and choose your favourite. Friends and Family with a birthday in January can sometimes feel that their special day is overlooked. To avoid that feeling may we suggest the ever tasty Giddy Yo chocolate or perhaps a head band from Nepal, Mitts, a Me To We Rafiki, Socks, Jewellery, a Singing Bowl or an elephant carry all. Our selection of Birthday cards..some plantable.. will add the finishing touch! Come in an make your choice. Struggling with gift ideas for those impossible to gift? May we suggest an eyeglass holder, a felt schnauzer, a 6' Giraffe named Jasper, honey stix, Cheeky Bee Candles, Me to We Rafikis, Tye Dye Tops, Buddha and much more! In every family there is a musical prodigy waiting to be found or perhaps your family enjoys making music together. This year why not experiment with some non traditional instruments such as the Thunder Drum in red, as the names suggests it sounds just like thunder when shaken. The spoons add rhythm to any song, a pan flute, the kalimba (also known as the finger piano) , the flute, singing bowls and drums. All of these instruments have been hand crafted by families whom as a result of Fair Trade have been able to enjoy improved education, health care , water and an overall improved quality of life. Come in and get the family band started. Choosing a Secret Santa Gifts or gifts of appreciation can be a challenge . May we offer these suggestions: Me to We Rafikis that support a variety of initiatives such as education, health, food, water and opportunity , the tasty treat of Giddy Yo Chocolate which is available in a number of flavours, Coffee from Planet Bean in Ground or Bean, Basic Spirit has a number of ornaments that donate a portion of the profits to supporting Planting Trees, Wild Spaces, Education, Animal Welfare , Beach Baby Soap or Lip Balm just because they have a lovely aroma , Warm Heart Mitts to keep hand warm. These are but a few ideas come into the store to see ideas . What brings out our competitive nature more than a Family game night perhaps one with multi generational teams. This season why not offer Snakes n' Ladders, Exasperation, Chinese Checkers or Connect Five to the line up. These games are handcrafted on the West Coast of Canada. The games boards are of Valchromat which is a hardwood based composite. There is also the labirynth games and tic tac toe coming from India. These are great fun and not as easy as they might appear. Hacky Sacs from Guatemala test our flexibility and in some cases our ability to juggle. Set your timer or hourglass to see how long you can keep the balls in the air. Let fun and laughter ensue when you start to play! Each year we feature a selection of nativity scenes and this season we are excited to offer these. Beginning with the centre nativity that has been hand-carved in Indonesia under the auspices of the Perkerti Foundation. This foundation works to assist struggling farmers and rural families by helping them sell their traditional crafts and provide funding for development. To the right the small nativity was crafted in Peru with the aid of the Manos Amigos artisan group. Manos Amigos meaning "hands joined in friendship" is a Fair Trade group that supports the export of handcrafted items from Peru. To the left from the Black Forest the nativity carved in relief from tree bark that has been harvested using sustainable forestry principles. Lastly, a three piece nativity crafted from Pewter here in Canada by Basic Spirit. Come in see these offerings. As the temperature drops we are always looking for ways to keep warm when we go outside or even while indoors. We are pleased to let you know that our alpaca scarves, wraps and blankets have arrived and are available in a variety of colours. Made in the Highlands of Ecuador alpaca is hypo allergenic , stain resistant and repels water. Our selection of mitts created from previously enjoyed sweaters is here and they are perfect for keeping your hands warm on those frosty days. Come in and see these and so much more. Who does not like to have something to put around their shoulders to give extra warmth or style to an ensemble? We are excited to introduce these three new wraps. The first piece in this vibrant colour from Nepal made from felt and silk in the centre and cotton trim. Our second offering is from Thailand and offers an embroidered pattern. This lovely piece can be worn as a wrap or a signature scarf. It also comes in black, burgundy or cream. The third wrap features pockets! Crafted in Thailand it is made of cotton and has the appeal of being an "everyday" wrap. The wraps created in Thailand have been made with the involvement of Frankly Scarlet and a group Kiva that assists with financing to assist the craftspeople. The soapstone animal collection is back offering Hippos, Giraffes, Rhinos, Owls and even Moose. These carvings have been created as a result of a six step process starting with the mining of the soapstone in the Kisii area of Kenya which is done by hand. The second step is to select the right piece for carving by immersing it in water and washing it. The carving of the soapstone is done by using knives, machetes and chisels. Once the carving is completed the soapstone is sanded, washed and then sanded again to give the piece a proper feel, the fifth step is the decoration where the refining of the carving is completed . The last step is to polish the piece using fine oils. These oils help bring out the colours of the piece and carving. All of this tradition is what makes these animals so special. Who likes having cold feet ? These alpaca socks will make sure that your feet are never cold. are unique in that they do not put a lot of stress on the environment due in part to their soft padded feet which minimizes soil erosion. Additionally as a member of the camel family they drink less water, nibble on the tops of grasses and there coat does not have lanolin so strong chemicals are not needed to process the wool. Alpaca wool has unique temperature elements due to some of air pockets in the fibre, it can keep you cool or warm, it is lightweight, does not usually shrink if cared for properly, resists piling and most importantly is hypo-allergenic, non itchy, water and stain resistant. Come in and see them yourself! As this cooler weather sets in we may be looking for new experiences to share with the young or in some cases mature people in our lives. Let us introduce you to these paintable pillowcases. They offer a variety of designs and will suit any skill set as the colours you choose are totally up to you. What a great way to spend some time together and have a lasting memory with the added bonus of sweet dreams! It will be such fun you will want to paint one for yourself! We are very excited to let you know that a variety of felt finger puppets have arrived. Created from felt in Nepal there is no limit to what stories the imagination can create. Our selection of puppets range from birds, pandas, bunnies, dogs, elephants and more. The work done by Hamro Village to support the creative artisans ensures that many families have food on their table and that their children are being educated. Come in and see them and start creating your own stories. Family gatherings can bring out our competitive natures. Why not level the playing field with a Hacky Sack from Guatemala. Can you juggle three ? Bounce them off your knee or elbow? The Bead Maze game is tricky as you try to get all three marbles in the centre, just when you get one or two in the middle someone could knock your arm and you have start all over again. Exasperation can be just that exasperating and so much fun . These are great ways to have fun with the family for all ages. The Craft Associations that support the artisans have provided an improved quality of life not only for the artisan but their families also. It is hard to believe that pieces such as this start from 55-gallon oil drums in Haiti. These drums are prepared by ensuring that any residual oil is removed by drying the interior of the drum with banana or sugar cane leaves. Once this process is completed the drum is set on fire to once again to ensure that any lasting residue has been removed. The drum is cut from top to bottom and the artists then work together to flatten the drum. Once flattened the artist will then work on the design (s) that they envision by drawing an outline in chalk. The design is then cut by using hammers, chisels and other tools. The artistic process continues as the designs are finessed and modified until the artist is satisfied with the finished product. There are not two pieces of Haitian Art that are exactly the same. This work has become important source of income to many Haitian families. Come in and see our selection. ideal for those with allergies . The Cheeky Bee Candle does not have any lead, zinc, paraffin or unnatural scents as well as other chemicals found in paraffin candles.. They also emit negative ions that have been proven to clean airbourne pollutants and germs as well as aid in the elimination of odours caused from cooking or our favourite family pet. They also provide great ambiance to any room or table. Cheeky Bee Candles are available in tealites, votives, tapers and candles in a honey colour or white. The "burn time" ranges from a couple of hours to 350 hours! Drop in and make your selection. We are excited to offer these leather bags handcrafted by the Jinger Family in India. These bags are made from goat hides that were once farm animals.. One tradition had the hides being used as water carriers but now the hides are re-purposed into bags, journals and wallets to name but a few products. The Jinger Family work from their home cutting the hides, tanning the hides and sewing the bags. The sewing is done the old-fashioned way and every blemish that appears is just part of the journey of the hide. Come in and see them! Our Giraffe Family has been on a bit of a break but are now glad to be back home. We are excited to acquaint you with Jasper, Marie, Irwin, R.J. and Walter. The family has come from Indonesia and each member like any family has its own great personality. They are very low maintenance and add a great touch of fun and whimsy to any room! Come in and see them for yourself. Labour Day Weekend heralds many changes with the start of school and our social groups getting back to meeting. The same can be also be said for others around the world as a result of the efforts of artisan organizations. Families who have been less fortunate are now being afforded the opportunity for a better education at all levels. Through the support of Fair Trade and the opportunities that it provides to the artisans improvements to education, health care, business resources and support is changing lives. metals such as copper and antimony. Basic Spirit offers a selection of salt shakers with whimsical tops such as moose , charm bowls, salt cellars in shape of canoes, the maple leaf as well fun yoga dogs and cats and oh so much more. During the festive and most of the year we have a selection of festive season ornaments. In addition to being Canadian made Basic Spirit also ensures that 10% of their profits is given to charities such as the We Foundation that helps with building schools in Africa, the World Food Program and World Wildlife Fund to name but a few. Come and see the collection. Are you looking for that special touch to make a gift look special? Look no farther than this offering of Hand Crafted Paper from India. In 1936, an oil chemist, K.B. Joshi from Navari was asked by a mill owner, Mayabhai Teli to find a use for the cotton seed fibre that remained after the oil had been extracted from the cotton seeds. He came up with a unique solution namely ,paper made of cotton. With advance of technology the concept of hand made paper changed however in the recent past it has started to make a comeback. Families and villages have started to be rejuvenated with the renewed interest in this lovely hand made paper. Come in and see for yourself. When a product tells you on the label that in addition to being free of gluten, nuts, dairy, soy, refined sugar & all other nasty funk you have no choice, it must be tasted. The crafting of this food not candy as also clearly stated on the label starts with Heirloom Equadorian Arriba Nacional cacao. The Giddy Yo team works with the farmers to ensure that the bean is grown in mineral rich soil free of chemicals and uses the freshest of water to name but a few of the qualities. Crafted here in Orangeville and is available in a number of flavours. Giddy Yo makes a great finish to a perfect meal, a flavourful souvenir, Thank You Gift and a personal treat! Drop in and choose your favorite! August is the month when plans for new adventures take on new life. So the gift of a Rafiki Bracelet to a friend is the non electronic way to stay in touch. Me to We is part of a family of organizations that has a shared goal of shifting mind sets from "me" to "we". Participants in We Day celebrations are based on actions not just buying a ticket and by engaging over 160,000 students in 4000 schools across Canada, the USA and the United Kingdom it is making a difference. This organization has also had a positive impact on building schools, improving healthcare and teaching women economic self sufficiency. We are proud to carry the Rafiki chains that are being created by women in Kenya. Each of these chains provides support to a variety of needs be it water, health, education and the results of your purchase . Cafe Femenino offered by Planet Bean is great example of how Fair Trade helps improve lives and in this case the lives of women. In 2004 in a remote section the Northern Andes a group of indigenous women took the initiative to formed a Women's Coffee Co-operative-Cafe Femenino. The need was born after years of playing a role in coffee production but not being compensated or recognized for their efforts. Member of the cooperative grow their own coffee and have been able to keep the revenue generated when it sells. The coffee grown by this group is organic and certified Fair Trade by Transfair Canada and the women are paid a higher rate for their product. Planet Bean has been able to make the unique connection with Cafe Femenino and it is supplied on a complimentary basis to the Guelph Women in Crisis. For the hot weather we have been experiencing may we suggest these cool and comfortable items. The Butterfly Top is ideal as a beach cover up, a casual around the house dress or paired with leggings or capris a great summer top. These dresses have been made in Nepal. The summer tank top is fun offering a cool comfortable addition to pants , shorts, capris and skirts. These tops have been made in Thailand. Come and see these and other great looks for your closet. There are few things more relaxing than sitting in a hammock under the trees with a good book and your favourite beverage. This beautiful chair hammock has been created by Oyanca Aresania in Nicaragua. This group was founded in 2001 by Tamara Pereira with the aim of providing additional export opportunities for Nicaraguan artisans. Oycana Aresania works with artisans from urban and rural centres and while the workforce is predominately men women have successful in joining and contributing to the groups success. This group has been able to provide training programs to enhance the techincal and business skills of the artisans. These hammocks are known for there comfort and have been hand woven on a simple loom using heavy gauge cotton thread. These hammocks will support up to 225 pounds. Ready to relax yet? In these days of heat we always need a glass to hold a cool drink. These glasses are created in the Cochabamba located in the Bolivian Highlands. These glasses have been mouth blown using all recycled glass and as a result creates the bubbling and make each glass unique. Crisil Srl is a family business and has been able to employ residents of the area who have difficulty finding employment. Crisil Srl, uses recycled glass which is gathered from local garbage, sorted, cleaned and melted to create these products. The employees are given the opportunity to learn the skills to produce these works. celebrate all things Canadian available in the store. All of these items are made by small entrepeneurs who are looking to make a difference. The Plantable Card collection had its birthplace in Trenton, the Cheeky Bee Candles are made in Warkworth, Mary Scattergood, Memory Painter, Author and Giddy Yo Chocolate are handcrafted here in Orangeville, the Planet Bean Coffee is from Guelph, while the Beach Baby Bath & Body has been crafted in Wasaga Beach , the games are from the West Coast British Columbia and the One Cover was created by a Mother in Alberta. Not pictured but available Basic Spirit Pewter from Pugwash Nova Scotia. Come and see these for yourself. What do you think of when you hear the word "Awesome"? The dictionary describes it as being extremely impressive, inspiring, magnificent just to name a few. In our lives we often have teachers or mentors that can be described as awesome so why not treat them to a gift made by truly magnificent artisans. The artisan could be a Master Coffee Roaster, a Chocolatier, a Pottery Artisan each taking a great deal of pride in their product and the benefits to their families. Father's like Mother's should be celebrated every day. This year when you think about Dad think Fair Trade. Father's have been able to earn fair wages, have safer work conditions as well as access to business training to name but a few as a result of Fair Trade. So when looking for something for the Father figure in your life why not think about Fossil Ice Cubes made in part by Afghani refugees, a picture frame to showcase your favourite photo, games such as tic tac toe handcrafted in India or Exasperation made here in Canada, Coffee is always good or journal to keep notes, pictures or a Curry Pot for a new culinary experience. Come in and see for yourself. June is a month when we want to take the opportunity to say "Thank You" to teachers and those who have provided mentorship over the past 8 months. May we suggest that these gift ideas . Everyone loves choclate and Giddy Yo made here in Orangeville is the best in dark chocolate, Cheeky Bee Beeswax Candles, Mango Wood Chimes made in India offer a number of motifs Hearts, Hummingbirds, Moose and Elephants, Coffee by Planet Bean to get the started or a lovely basket made for Kaisa Grass and saris from Bangladesh and the Me To We Rafikis give back in may ways to the Mothers' in Kenya. Come in a take a look. The Kalimba is known as a modern day example of an ancient family of African musical instruments. The mbira or a thumb piano is the ancestor to the kalimba. The mbira evolved throughout Africa with each area tuning and changing the design- the number of tines or the type of wood or gourd that was used- to best reflect their music. The mbira played a different role in the social life of each commnunity; something to play while tending cattle, riding the bus, to celebratie events such as a weddings or to accompany singing. In some areas it was used to attract the spirits of ancestors so that their advice could be heard. cheese board with the word Celebrate or a singing bowl. These are just a few suggestions come in see what your graduate would enjoy. Wedding Season has arrived. Now the difficult task of finding a gift for couple. Do you go from their registry or off? We suggest going off the registry with perhaps a Board Game that will also serve as art , felt flowers or the dog they have always wanted but do not have time to care for made from felt in Nepal, lovely place mats from India or a small cheese board , glasses from Bolivia or a Curry Dish. All of these gifts offer any couple a gift that makes a difference to the lives of the artisans. Mother's should be celebrated everyday however on the second Sunday in May we make sure that Mother is honoured. Now comes the challenging time in trying to find the perfect gift. May we suggest the table decor from Tanzania, the brightly coloured scarf from India, perhaps Mom has wanted a pet why not a felt dog from Nepal or a unique piece of jewellery from Thailand. Whatever you choose the choice helps Mother's and their families what better way to celebrate Mother's Day! Mother's Day is just over a week away have you decided what you might enjoy receiving or giving? May we suggest a lovely hostess tray hand or the flower pot hand painted from India, the lovely round basket made in Bangladesh from kasia grass and saris, a singing bowl, a beeswax candle from Cheeky Bee or a bright scarf designed to add vibrancy to any ensemble. Whatever you choose the choice helps Mother's and their families what better way to celebrate Mother's Day! for walks and we offer an owl and elephant. Completing the picture is the leather backpack/purse made from goat hides in India. Drop in and make your selection. What Cat does not need a cozy place to snuggle and what better place than a Cat Cave. Yes, a Cat Cave made from felt in Nepal. These beds along with their canine companions have been created by using 100% raw sheep wool. The wool has been painstaking separated into small tufts, layered together, washed to bind the tufts together several times then rolled and pressed. This is a very simplistic version of the process it requires a lot of patience to create the felt before it can be used to craft these treasures. Hamro Village has been working with the artisans in Nepal for many years with the result of their efforts seen as families have enjoyed a steady income, children have received an education and the opportunities that education affords. Come and see these works for yourself. With all of the gray skies we have had we could use a little or a lot of colour in our lives. To that end we recommend thinking Fair Trade. With products coming from India, Thailand, Madagascar colour abounds. The planter baskets made from recycled tires have been brighly painted and add a splash of colour to your entry way, perhaps the blue clutch from Tanzania will make your ensemble "pop" . Brighten your table with the vibrant napkins in summer yellow or blue along with the placemats. The Wise Owl will certainly add flare to any room inside or out. Colour abounds with Fair Trade come and make your choice . Are you looking for a way to have some family fun? We are excited to introduce these classic games that can bring out our competitive spirit with your choice of Snakes and Ladders, Exasperation, Connect 5 or Cribbage. These games have been crafted by West Coast Games a company that started in 2014 by doing custom woodworking with products such as signs, tables, serving trays and cribbage boards. They expanded their game offering when asked to create one of these family favourites and then added the feature that they could also serve as wall art. These games provide storage in the back for the the cards or pieces necessary to play while being able to add decor to a family room. Come in see these games for yourself and plan your Family Game Night! Easter Weekend has arrived and it is time to add jf colour to your wardrobe. The colour may be the clutch purse from Tanzania, or statement necklace from Indonesia. The hand embroided purse from Thailand will set off any ensemble or a pair of pastel coloured earrings. The outdoor market is just a few weeks away so come and see the shopping baskets in a variety of colours. The support of Fair Trade provides untold benefits to families. Easter and the start of Spring always gives us a reason to look for something new. This year think about the Bunnies made from Mango Wood in India to add the fun factor to your Easter Table. The Handpainted Serving Tray also from India is a great place to display eggs or other treats of the day. Our wardrobes always enjoy a lovely scarf in spring lavender, A new clutch purse from Tanzania will add an elegant touch to any ensemble,. Coffee and Giddy Yo Yo are always the perfect Hostess gift. Fair Trade has always supported green. Not necessarily the colour but green in terms of recycling. Fair Trade artisans repurpose what ever the can as shown in the picture above. A few of the times available include glasses made from recycled glass in Bolivia, the planters have been made in India from used tires, the oven mitt also from India is made from saris, we also have the Guru skirts made from saris, trivets and coasters from Viet Nam created from old magazines, mitts from recycled sweaters and a favourite the plantable card. Come and see for yourself. March is often a month for change. During the March Break new hair styles are experimented , new clothing styles and spring resolutions made. Drop in and see these exciting offerings. Our friends Lynn and River were gracious enough to not only try on the clothes but let us take pictures. River is showing the Owl Skirt, the size is adjustable and offer a pocket in the front to keep all treasures. Lynn, is also wearing not only adjustable but reversible skirt. The skirt features an attachable purse for cell phones and change. All of these clothing items are made from Organic Cotton in Nepal. Drop and try them on! Singing Bowls really do sing. These bowls have been created by machines in Nepal and have many ways in which they can be utilized. The bowls are made from materials such as gold, silver, copper and iron and the more modern bowls have a mixture of these metals. In Tibetan Buddhist practice they indicate the beginning and the end of silent meditation. In other Eastern Buddhist cultures the singing bowl is used to signal a passage of time, a change in activity, funerals and worship. Teachers have been known to use a singing bowl in the classroom to get the attention of their students. To hear the bowl sing it may rest on a cushion in your hand or table, with a wood mallet the bowl is touched and the mallet gently circles the rim of the bowl. The circling of the bowl with the mallet causes it to sing. Each bowl has its own unique tone. Drop in and make them sing for yourself! There is nothing like a hot beverage to take the chill away! We have a selection of 4 o'Clock Teas to help. Did you know that Green Tea is known to reduce fatigue and increase concentration? It is the perfect choice to enjoy with friends. Roobios Tea, an afternoon favourite, is crafted from the rooibos shrub in South Africa. In addition to being caffeine-free it is also low in tannins, rich in antioxidants and minerals. These are just two of the tea choices available. Why not come and find your favourite. A warm beverage deserves a favourite mug. The Drip and Sip Mug has been created in Nepal by the artisans of the Sana Hastakala Group. Sana Hastakala meaning small handicrafts ensures that fair wages are paid and that the artisans receive training in design, marketing, business as well as access to interest free loans. As a result of this artisan members are able to improve the tools, equipment and the conditions in which they work. February in our house was the month of cooking experimentation. New recipes were debuted and if successful were featured on the meal roster for the rest of year. We are excited to introduce this set of recipe cards geared to young people but good for all ages. There are 40 cards in total offering recipes in these food groups, eggs 'n' beans, fantastic fruit, milk 'n' dairy, spuds 'n; grains and of course vegetables. For all those budding chefs these cards are a great way to start to learn to cook. If you prefer gardening then the Kids' Garden Card offers projects that can be done. The Yoga Pretzels give you the opportunity to learn and do yoga moves with the family. Drop in and see for yourself. The cards make a great activities to enjoy during this upcoming Family Day Weekend and March Break. E BlasValentine's Day is just around the corner may we suggest these gift ideas. Its shows that not only do you care for your partner but the welfare of others by supporting Fair Trade. own locally made Giddy Yo Yo. improve education, housing, water supply and health care. Crop in and see for yourself. Cafe Femenino Program International shared Náyade Rodriguez's post. The Mexican Cafe Femenino Program, established in the Cesmach Cooperative in Chiapas more than 10 years ago continues to grow and flourish. The membership of women continues to increase year to year. Not only are they leading the way in having control of their own coffee production but they are leading social projects like chicken breeding programs and honey production in their communities. Because Cafe Femenino Standards require the formation of a women's group, they now have over 10 years experience as a united voice with the ability to request funding for projects from organizations like the Cafe Femenino Foundation and Heifer International. One of the initiatives the group established many years ago was roasting and selling domestically their own Cafe Femenino coffee. We are proud of how far this women's group has come and look forward to many years ahead! Are you heading south to get away from our winter weather? May we suggest these choices as ideal selections for your beach wear, casual wear or evening wear. The Butterfly Dress offers the perfect cover up for the beach or teamed with capris pants great day wear, the Guru Skirt made from recycled saris is light to pack, can be worn in many ways the only limit is your creativity. The skirt is ideal for day or evening. The light cotton top is also great for the beach or for day use . All of the artisans who have created these pieces have been paid a fair wage and as result been able to offer their families better education, health care and food. If hot chocolate is not your choice how about a hot cup of tea by 4 O'Clock also Fair Trade Certified and Certified Organic. The Roobios which means "Red Bush" in Africans is crafted from the needle like leaves of the Roobios shrub in South Africa. It is naturally caffeine-free and just one of the offerings available. Our last recommendation for a hot beverage is our Planet Bean Coffee, It is available in Ground or Bean, Single Origin or Blend. Friends and Family with a birthday in January can sometimes feel that their special day is overlooked. 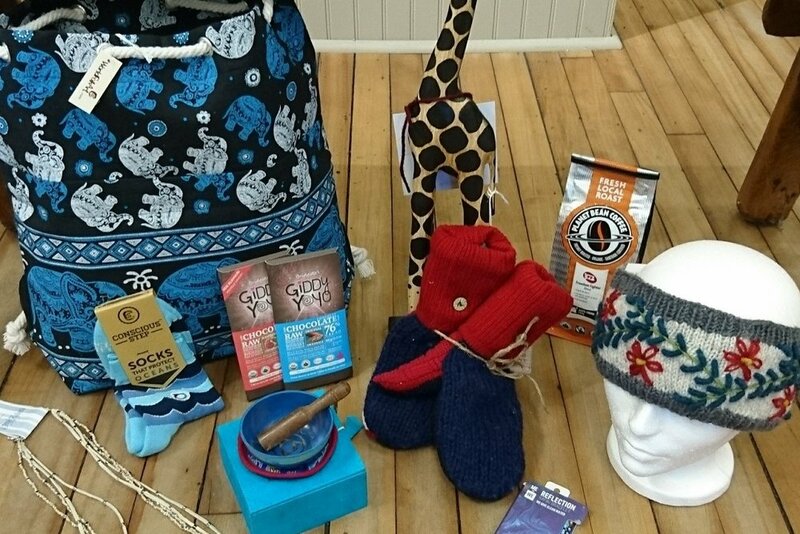 To avoid that feeling may we suggest the ever tasty Giddy Yo Yo or perhaps a head band from Nepal, Mitts, a Me To We Rafiki, Socks, Jewellery, a Singing Bowl or an elephant carry all. Our selection of Birthday cards will add the finishing touch! Come in an make your choice. The artistry and creativity that is found both abroad and in our own backyard never ceases to amaze. For those last minute ideas come in and see what the world offers and know that lives are being changed. With ten days until Christmas and shopping to do where to you do go why Sproule's of course. There are backpacks from Thailand, jewelery as well, socks to save oceans and feed children too, mitts, hats and headbands to keep off the chill with mugs for the coffee..Planet Bean of course and a Giddy Yo Yo just for you. All of these items and so much more really do change lives. Come in and see what the world offers. Are you in pursuit of a purse or bag? Sometimes we just need something small to hold a bit of cash, bank card,a cell phone or even our passport. May we suggest our Passport Holder made in Thailand. These aritsans also create wallets that work as easy to carry and handy if you have your hands full. If your need is something more elegant for a night on the town we have beaded bags from Indonesia. The Pink Backpack is ideal for when we have to carry multiple things perhaps for multiple people and are made in Thailand. For the smaller person in your life nothing catches their eye like a sparkly purse or perhaps an Owl Felt Purse. Whatever your choice the lives of the artisans has been changed with access to better education, health care, food and training. Secret Santa Gifts can sometimes be more problematic to buy than some people on your shopping list. These are our suggestions to help relieve the stress. Coffee or Tea for those who enjoy a great taste, Giddy Yo Yo is a guaranteed success with a choice of over 14 flavours, mitts or texting gloves, a seasonal ornament from Nepal or Basic Spirit . Me to We Rafikis, a note book or book mark . Perhaps Elves for just a hint of magic this season. These are just a few suggestions. Come in and see what else may suit. Your support of Fair Trade assists in so many ways and in so many places. Brrr!!! it is cold outside and time to bundle up. May we suggest Headbands handknit from Nepal available in a variety of colours in two patterns cable knit or flowers. New this year are Texting Gloves from Ecuador. Shown in front in green but available in assorted colours. Also, from Ecuador are the Animal Hats and Mitts all are lined with polar fleece and in addition to making your child easy to find keeps their heads nice and warm. Mitts crafted by Warm Hearts made from recycled sweaters keep your hands toasty. You never know what patters or colours you will see. For your neck we have the Alpaca Scarves. Drop in and make your choice. All of the families who have created these knitted pieces are enjoying the benefits of a steady income, better education and healthcare. nativity scenes. For the music lover in your life the guitar nativity, for a family member who lives out of the country perhaps a Mountie Scene or Log Cabin Nativity. These are made in Peru by Manos Amigas which means "Hands Joined in Friendship" , This group looks all over Peru from Lima to Andean Highlands for their artisan members. Every couple of year the group offers training to its members and profits are directed to feeding programs for children as well as school uniforms and supplies. Basic Spirit from Nova Scotia is the creator of the Pewter Nativity and 10% of the profits are directed to Canadian Charities. The Soapstone Nativity is from the Kissi Region of Kenya and the creation of these pieces changes the lives of the artisans. better education, health care and oh so much more. We are excited to introduce these new felt items into the store. Starting from the top the perfect solution for someone who wants a pet that is low maintenance. The Finger Puppets allow the imagination to create all types of the stories while the Wizard Hat is great for budding magicians or story times. All of these items have been handcrafted in Nepal through the efforts of Hamro Village. This group works with the 47 different ethnic groups in Nepal. One of the projects that Hamro has assisted with after the earthquakes has been to provide four water tanks and pipelines to four different villages thus reducing the outbreak of cholera and other water disease. With the change in the temperature this week it is time to find our hats and mitts. We are excited to offer these hand knit animal hats from Nicaragua. The Owl, Minion and Canada hat are but just a few samples. To keep little hands warm there are also complementary mitts. New this year are mitts for texting also hand knit in Nicaragua. The bright multicolour pair is such are pair. As a result of the support of Casa Relief the children of the families who knit have enjoyed a better education through improved schools with running water, books and other important educational tools. We are excited to have the Warm Heart Mitts -crafted here in Orangeville- again this season made from recycled sweaters. These mitts together with the hats will keep your head and hands toasty. Look what new items have arrived in soapstone. The animal collection has gained a Canadian member, a moose! Winter sports are featured with a curling rock, anativity scene and of course the hearts. All of these pieces have been created with Kissii soapstone which is available only in Kenya. The Kissii soapstone is a soft stone that allows it to be carved into many shapes. The carving of this stone is done with a large knife known as the "Panga" and the fine details are done by smaller carving knives. The soapstone is then sand-washed, sun-dried and painted. Some of the colours are achieved by using ink, paint and even shoe polish. The finishing touch to achieve the shine on the soapstone is done by using a soft cloth and applying a bit of wax. Through the support of artisan groups families have enjoyed improved education, health care, counselling and had access to business professionals . The face of Buddha is not limited to just one traditional look it offers many each with its own meaning. We are pleased to offer two faces. The first, is the Protection/Overcoming Fear Buddha located on the back left side of the picture. The right hand that is raised is said to symbollize a shield which offers protection from what may be causing fear. The second, is the Happy or Laughing Buddha. By rubbing the tummy of the Laughing Buddha it is said that your wishes may be granted. Additionally, the Laughing Buddha may wear beads around the neck which symbolizes Pearls of Wisdom. The Laughing Buddha is often found in homes or business signifying abundance and prosperity. These Buddhas have been hand carved in Indonesia. Family gatherings can in some instances bring out our competitive spirit. Why not level the playing field with a Hacky Sack from Guatemala. Can you juggle three ? Bounce them off your knee or elbow? The Bead Maze game is tricky as you try to get all three marbles in the centre, just when you get one or two in the middle someone could knock your arm and you have start all over again. And while the triangle memory game and the wooden star look easy to reassemble they are not. These are great ways to have fun with the family for all ages. The Craft Associations that support the artisans have provided an improved quality of life not only for the artisan but their families also. Thanksgiving Weekend is almost here and it is time to think about what we might gift to our hosts. Coffee is the perfect finish to any great dining experience and accommpanient to any after dinner liqueur. We are always pleased to suggest Planet Bean Coffee, they have a variety of Dark or Lighter Roasts in both bean and ground. Combine this with the taste of a Giddy Yo Yo chocolate, the healthy dark chocolate handcrafted here in Orangeville. For ambiance Cheeky Bee Beeswax candles offer a subtle honey aroma and light to any table. Drop in and make your selections. Families from around the world are enjoying better lives as a result. ideal for those with allergies . The Cheeky Bee Candle does not have any lead, zinc, paraffin or unnatural scents as well as other chemicals found in paraffin candles.. They also emit negative ions that have been proven to clean airbourne pollutants and germs as well as aid in the elimination of odours caused from cooking or our favourite family pet. They also provide great ambiance to any room or table. Cheeky Bee Candles are available in tealites, tapers and candles in a honey colour or white. The "burn time" ranges from a couple of hours to 350 hours! Drop in and make your selection. Are you looking for a unique timepiece to add a whimsical touch to a room? Look no further than these battery operated clocks from Bogata, Columbia. These timepieces have been created by the artisans of Oxidos which was founded in 1994. Since this time these artisans have been creating these clocks by using recycled metals and their unique vision. The members of Oxidos are committed to maintaining ethical values and sustainable business practices. Additionally, the over thirty artisans of Oxidos craft these eco-friendly clocks in an open space environment , work in safe conditions and most importantly are fairly paid for their work. Each of the items featured have been created by the artisans of the Asha Handicrafts Association. Asha, which means hope in Sanskit was started by a group of professionals who were responding to the poverty seen by artisans who were being taken advantage of by middlemen. Asha Handicrafts encourages cottage industries that preserve traditional crafts and as a result enjoys over 6500 artisan members in India. The members of this group are able to benefits from marketing, design consults, product development as well as interest-free loans, medical care and educational scholarships for their families. Training is made available in communities that teach business skills as well as health care as it relates to addictions and family planning. Asha also ensures that women play important roles in the artisan group. Drop in and try your hand at the memory game or getting all the balls in the centre of the circle or the secret puzzle boxes. Many of us have friends or family preparing for new adventures in September, why not send them along with a gift to remind them of you and home. Hacky Sacs and Worry Dolls from Guatemala are ways to reduce stress, while the Owl may hold a favourite picture, coasters keep the furniture tidy all while the Happy Budha brings a smile to your face. All of the artisans keep to traditional methods of the creating this items and have been fairly paid for their efforts. The Me to We Collection of Rafiki chains offer the perfect remember me gift! The very word, Rafiki, means friend in Swahili so what better way tobe remembered as you start new life adventures. In addition, to creating a memory they have the added benefit of providing water, pencils. medical treatment, education and income to hardworking Maasai Mamas in Kenya. The code on the back of the package provides you with the opportunity to see the affect your choice has made. Drop in and see the collection. When a product tells you on the label that in addition to being free of gluten, nuts, dairy, soy, refined sugar & all other nasty funk you have no choice, it must be tasted. The crafting of this food not candy as also clearly stated on the label starts with Heirloom Equadorian Arriba Nacional cacao. The Giddy Yo Yo team works with the farmers to ensure that the bean is grown in mineral rich soil free of chemicals and uses the freshest of water to name but a few of the qualities. Crafted here in Orangeville and is available in a number of flavours. Giddy Yo Yo makes a great finish to a perfect meal, a flavourful souvenir, Thank You Gift and a personal treat! Drop in and choose your favorite bar this weekend! When the weather co-operates there is nothing like dining outside. A splash of colour added to any table is fun. The colour may be a placemat from Vietnam or India, a dinner size napkin from Bangladesh in bright yellow or blue or perhaps a glass from Boliva. All of these ideas will add to your table and gives families the opportunity to change their lives. Casa Relief is just one many groups that we have made connections with. Supporting Fair Trade can and does make a difference in lives. shower or wedding gift. The Wine Rack has been carved from Acacia Wood by the artisans of the Saffy Group in the Philippines. The ceramic bowl has been made by artisans in the Hebron Group located in the West Bank. The Blue glass and Pitcher are made from recycled glass in Bolivia. The soapstone Lovers' Knot or Dancing Couple have been carved from soapstone found in the Kissi Region of Kenya. While not pictured a hammock form Nicaragua is unique gift. For the couple who may have everything think Fair Trade as it really does make a difference to lives and keeps time honoured traditions preserved. Come in see these and other great ideas. Summer Holiday season has arrived. For thoses visits with Friends and Family may we suggest these hostess gifts. Bright coloured dinner size napkins crafted in Bangledesh, Mango Wood Coasters and Four Bowl Basket from India, or Mosaic Coasters from Bali and Placemats from India. Each of the groups that produce these gift ideas are finding new ways to support their families, improve the opportunities for education and healthcare. Shopping Fair Trade does make a difference. COme and see what the world offers. This weekend as we Celebrate Canada's 150th Birthday let us Celebrate these Canadian Companies that make a difference. Father's Day is fast approaching and it can be difficult to know what to gift Dad. May we suggest an eyeglass holder made in India the perfect spot for glasses that continually loose themselves! Planet BeanCoffee in either Bean or Ground, Blend or Single Origin is a flavourful choice. For Dad's who meditate there are singing bowls, a Buddha. Journals from Nepal, Me to We Canada Collection and reusable ice cubes made from fossil stones. Do not forget that hammock for a place to relax . All of these ideas have helped the men work towards creating stronger foundations for their families. By earning wages they are able to see improvements in education, health care and life expectancy for themselves, their children and their communities. Come and see what the world has to offer. Shop Fair Trade, it really does make a difference. Father's Day is just days away and the head scratching of what to gift Dad is beginning. May we suggest a hammock. There is nothing more relaxing on a summer afternoon than a nap outdoors. These hammocks have been created in Nicaragua by the Oyanca Artesania. This group was founded by Tamara Pereira whose aim it was and remains to provide opportunities to export Nicaraguan products. The hammocks are woven on simple looms and tied by hand. The artists of the Oyanca live in both rural and urban areas and while it supports a number of men it also supports women who are able to work from home. This allows the women the opportunity to help support their families, earn a living and independence. These hammocks will support up to 115 kg..
As one of our new greeting cards reads "The Most Magical Form of Communication is Music". As we enjoy music this weekend in Orangeville drop in and see what instrument inspires you. Perhaps it is the Bajana Drum crafted in West Bengal and Uttar Pradesh, the Bamboo Chimes from the Philippines with 18 finely tuned metal pipes. Perhaps it is bamboo flute , a Thunder Drum,, the Kalimba also known as the finger piano or a Singing Bowl. Come in and find your favourite musical instrument. Summer is on the way albeit slowly. We are pleased to offer these choices for your summer wear. Dresses made in Nepal that are versatile and can also be worn as a top with capris or act as a beach cover up. The Elephant Dress for our young fashionistas have also been made in Nepal can be worn as a top with a great pair of shorts. The top has been in created by the talented artisans in Thailand. These are just some of the fashions available come in and see what the world offers. Victoria Day Weekend is often considered the beginning of gardening season. While the spring tulips in our gardens have been lovely we now start thinking about other elements for our outdoor spaces. We are excited to offer these wind chimes that can nestle in your garden and add a melodious touch. Produced in Manila by Saffy Handicrafts. The brightly coloured flower pots are hand made in India from recycled tires by the artisans of the Noah's Ark Group. The Blue and White Planter has been made in Viet Nam by the artisans of Vilaco. All of these artisans have been given the opportunity to learn skills that will support not only themselves but also their families. As a result of their efforts the artisans have been able to enjoy improved healthcare and education including business skills. World Fair Trade Month continues and these are just a couple of facts from the Fair Trade Canada website ,did you know that there are approximately 1.66 million farmers working in fair trade certified producer organizations and that 25% of all farmers and workers in fair trade are women. One of the coffees offered by Planet Bean is Cafe Femenino. Women who live in the remote areas of the Northern Andes have developed their own coffee co-operative. The sales of this coffee are used to improve the quality of the lives of their families. Fair Trade it really does make a difference to someones life. May is not only the month in which we celebrate our Mothers' but also the month we celebrate the achievements of Mothers'. Fair Trade shopping is just such an example. With all of the companies that we have been fortunate enough to work with Mothers are at the heart. The contributions that women have made in the design, production and business management have aided in providing more opportunities for their families. Pictured above are just a few suggestions, Flower Pots made from recycled tires and scarves created from saris both made in India, mugs from Vietnam, jewellery from Indonesia. Drop in and see what the world has to offer! What would our lives be like without our Mother's, Grandmother's or Aunt's? For some, this year, Mother's Day will be celebrated for the first time while for others, the number of times is not to be counted! When thinking of a gift for Mom think Fair Trade. The role of women in many emerging countries is changing and it is important that we support their efforts to improve their lives and those of their families. Just new are flower pots made from recycled tires in India, Ponchos from Thailand, Tops form Indonesia so drop in and see what the world has to offer! With Mother's Day just a few weeks away we are very excited to introduce these new pieces handcrafted by Crystal McMaster. Crystal has been designing jewellery for just over twelve years and offers a variety of one a kind pieces in both necklaces and earrings. They also make lovely "Thank You" Gifts for Bridal Parties. Come in and see them and add a bit of sparkle to your day. May we present a new member of the Crisil Srl glass family, the dot deco design. Handcrafted in Cochabamba Bolivia from recycled glass that has been collected from local garbage dumps by local companies that in turn sort the bottles before being sold to Crisil Srl. The glass is then cleaned and melted in furnaces by Crisil, the glasses are created and then sent workshops for the etching of the new design. Currently available in a stemless glass which is ideal for any type of beverage or with a stem that is lovely for a sweet treat presentation. The production chain has helped to improve the quality of life for families resulting in better healthcare and education .Drop in to see them. Who does not like a splash of colour in their ensembles? These swing coats offer just that with the red on the pockets. Made in Thailand these swing coats offer style and comfort. Frankly Scarlet introduced these coats and are proud that the women crafting them have been able to improve their quality of life. Frankly Scarlet is committed to paying a fair price for the products and as a result have been able to provide a stable, steady trade relationship with the women who create these fashions. Come in and see them for yourself. ideal for those with allergies . The Cheeky Bee Candle does not have any lead, zinc, paraffin or unnatural scents as well as other chemicals found in paraffin candles.. They also emit negative ions that have been proven to clean airbourne pollutants and germs as well as aid in the elimination of odours caused from cooking or our favourite family pet. They also provide great ambiance to any room or table. Cheeky Bee Candles are available in tealites, votives, tapers and candles. The "burn time" ranges from a couple of hours to 350 hours! New in the fall were the Handy Can Candles! Drop in and make your selection. March Break is the week that inspires us to spring up our wardrobes. The winter clothes are becoming boring and an infusion of colour is needed. We are pleased to suggest these colourful ponchos. Made in Thailand from chiffon and devore fabric they are two scarves sewn together with eco-friendly coco buttons. Some come with both a touch of bling and fringe while others without. Additionally,they can be worn two ways: the first, with the pattern down the front or alternatively with the pattern over the shoulders. Cme in a try one on today and add a touch of spring to your wardrobe. Singing Bowls really do sing. These bowls have been created by machines in Nepal and have many ways in which they can be utilized. The bowls are made from materials such as gold, silver, copper and iron and the more modern bowls have a mixture of these metals. In Tibetan Buddhist practice they indicate the beginning and the end of silent meditation. In other Eastern Buddhist cultures the singing bowl is used to signal a passage of time, a change in activity, funerals and worship. Teachers have been known to use a singing bowl in the classroom to get the attention of their students. To hear the bowl sing it may rest on a cushion in your hand or table, with a wood mallet the bowl is touched and the mallet gently circles the rim of the bowl. The circling of the bowl with the mallet causes it to sing. Each bowl has its own unique tone. Drop in and see them for yourself. The Kalimba is a musical instrument available at Sproule's Emporium. Did you know that kalimba is the modern day version of the ancient African musical instruments the mbira. The mbira evolved throughout Africa with each area tuning and modifying the design whether it was the number of tynes, the type of wood or gourd used to best reflect their music. The kalimba played a different role in the social life of each community it could be played while tending cattle, riding the bus to celebrate events such as weddings or to accompany singing. In some areas they were even used to attract the spirits of ancestors so that their advice could be heard. February in our house was the month of cooking experimentation. New recipes were debuted and if successful were featured on the meal roster for the rest of year. We are excited to introduce this set of recipe cards geared to young people but good for all ages. There are 40 cards in total offering recipes in these food groups, eggs 'n' beans, fantastic fruit, milk 'n' dairy, spuds 'n; grains and of course vegetables. For all those budding chefs these cards are a great way to start to learn to cook. Drop in and see for yourself. The cards would make a great activity to enjoy during the upcoming March Break. Would you like something out of ordinary for Valentine's Day? Shown above are just a few suggestions. There are Heart Mugs and Plates, Soapstone Hearts from Kenya as well as the animals, Lovers Knots, necklaces, bracelets and scarves from Indonesia and Thailand, Cheeky Bee Candles and of course the Giraffe Family. Come and see for yourself it really does feel good to help improve lives. Valentine's Day is still a few weeks away however, it is never to early to start planning. While the winter has been unusual so far we can never be warm enough when the cold returns as we know it will. It is not to late to for a fleece lined hand knit headband from Nepal , a warm hat or sweater from Ecuador,a new pair of mitts made from recycled sweaters crafted here in Orangeville or a cozy alpaca scarf or blanket. All of these items provide warmth additionally to the people whose talents create these pieces. Families have been able to complete their education and learn new skills which in turn assists their communities through the support of Fair Trade. Come in and see what will keep you warm. There is really nothing like a hot cup of tea or hot chocolate to warm you up on these cold days. We are always excited to talk about the Camino Hot Chocolate which we have available in either Milk or Dark Chocolate. Camino Hot Chocolate is easily prepared by simply adding water or milk. It is Fair Trade certified, Certified Organic and Gluten-Free and add to that it tastes great too! If hot chocolate is not your choice how about a hot cup of tea by 4 O'Clock. Like the Camino Chocolate it is Fair Trade Certified and Certified Organic. The Roobios which means "Red Bush" in Africans is crafted from the needle like leaves of the Roobios shrub in South Africa. It is naturally caffeine-free and just one of the offerings available. Come in and choose yours. Friends and Family with a birthday in January can sometimes feel neglected. May we suggest a lovely necklace, Beeswax Candles, Camino Hot Chocolate, a new pet (hand carved) and the ever tasty Giddy Yo Yo. Our selection of Birthday cards will add the finishing touch! Come in an make your choice. abound! Drop in and make your choice. Do you have someone in your life that is looking for cat, rooster, elephant, giraffe or perhaps a Zebra? Well look no farther. We are excited to offer these choices in our "pet" collection. They are all low maintenance , create conversation amongst guests and are just fun to have around. The faces of these animals are unique and show spirit while exuding a sense of humour. Hand crafted in Indonesia. Come in and make your choice. There is always one person on our Christmas list that is difficult to gift. For those people we have a number of items for your consideration. From Baskets from Africa, Giraffes from Indonesia, Soapstone from Kenya, Scarves from Thailand, Socks from Ecuador, Recycled Glass from Bolivia and so much more....each of the communities that have created these products have felt the impact of your support of Fair Trade . Improved education, healthcare, women's rights and living conditions to name but a few. Drop in and see what the world offer this Festive Season. We also have nativity scenes made from soapstone, olive wood and pewter. Secret Santa gifts can sometimes be a challenge to buy. May we suggest a Rafiki Chain by Me to We. These chains are made by Mother's in Kenya and in Swahili rafiki means friend. New this season are Ornaments from Basic Spirit. Proceeds from these ornaments support planting trees, world peace, education and breast cancer. There are ornaments from India, Nepal and Kenya made from soapstone. These ornaments have been hand created. Families have had their lives improved by the purchase of Fair Trade items. Come in and make your Secret Santa choice. What is the Penguin saying to the Peacock or to the aligator? The stories that can be created with Finger Puppets are only limited to what our imagination can create. Hand crafted in Nepal by the artisans of Hamro the choice of puppet is yours. These artisans have also designed Christmas Ornaments that are ideal for any tree. Through the care and concern of the Hamro Team many socially and economically deserving Nepalese have been able to obtain an education, enjoy improved living conditions and health care. Drop in make your choice and start creating your story. Coffee, Tea and Hot Chocolate are some of the best beverages to talk and catch up with friends. We are excited to offer 4 O'Clock Teas in a variety of flavours including Roobios and Peppermint. Planet Bean offers a variety of single origin or blends all fair trade and in ground or bean. The Camino Hot Chocolate provides a rich flavour in your choice of milk or dark chocolate. The farmers who have harvested the raw products have been able to improve the quality of the lives of their families. Drop in an make your choice. In keeping with the let us keep warm theme of the past couple of weeks let us now feature these sweaters. Hand knit in Ecuador these sweaters offer a stylish three button collar. Through the support of Casa Relief the families of the knitters are able to attend school, enjoy health care and drink safe water. Drop in and see them. While the end of October has been known to bring the cold weather it always seems to be to soon. To warm up your wardrobe we suggest that you come and pick out a warm alpaca scarf, blanket or shawl. Casa Relief has been working with a family in Quechua located in the Andes Mountains in Ecuador. The scarves and all of the alpaca products Jose and his family create are done on a traditional tradle loom. Through the efforts of Casa Relief and their support of Jose he has been able to take a business course at a local university from which he recently graduated. As a result Jose is better able to assist his family and his community with their business knowledge and skill set. Jose has also been able to take advantage of some of the Ecuadorian government programs for indigenous artisans. Alpaca wool is hypoallergenic as it does not have lanolin, it is moisture resistant, offers a number of colours and some say warmer than wool! Drop in and feel it for yourself. Last week we talked about animal hats for the young people in our lives this week we focus on fun adult headgear. These arrived this week and have been hand knit by artisans in Nepal. These fleece lined headbands are in a braided pattern as well as decorated with flowers. Hamro Village has worked diligently with the women in the outer areas of Nepal to create these pieces. As a Fair Trade Federation member Hamro Village ensures that the artisans are paid fairly for their work which in turns allows them to provide food and education to their families. Drop in and see the collection soon. Are you looking for something to make the little person in your life easy to find? Look no farther. The collection of hand knitted hats and mitts (with strings) from Nicaragua has arrived. There is even a Minon hat! These hats are fleeced lined for added warmth. The women who make these hats and mitts are able to contribute to health care and education for their families. Casa Relief has worked in their communities to improve the schools and water supply in addition to many other projects. That the manufacture of these products should provide a fair income and encourage and promote the traditional skills of women in developing countries. Drop in and see these items for yourself. ideal for those with allergies . The Cheeky Bee Candle does not have any lead, zinc, paraffin or unnatural scents as well as other chemicals found in paraffin candles.. They also emit negative ions that have been proven to clean airbourne pollutants and germs as well as aid in the elimination of odours caused from cooking or our favourite family pet. They also provide great ambiance to any room or table. Cheeky Bee Candles are available in tealites, votives, tapers and candles. The "burn time" ranges from a couple of hours to 350 hours! New this year are the Handy Can Candles! Drop in and make your selection. What is your favourite colour, favourite animal? Is it a giraffe ,a hippo, an elephant, an owl or cat? All of these are available in a variety of colours. Handcrafted in Kenya using soapstone each piece is carved using knives and other unique tools.. These animals make great paper weights, great collectibles and are just fun low maintenance pets! Drop in and see them. Are you in need of some good energy? The Laughing or Happy Buddha is just the cure. Earnings its name from a Buddhist Zen Monk Quieci who lived over a thousand years ago who always wore a big smile,encouraged everyone to enjoy life and stay happy. According to the lore about the Happy Buddha he arranged for fireworks at his cremation, This was so unexpected that his mourners could not stop smiling or laughing. The carvings of the Happy Buddha show a large stomach which should be rubbed often and in a positive manner to ensure that wishes are granted. The beads on these statues represent pearls of wisdom. The Laughing Buddha likes to be placed at an entrance where he can see the door and it is not recommended that they be placed near electronics, your bedroom or the floor. The Laughing Buddha is not worshiped but instead provides good energy and prosperity in your home or office. Come in and see ours. Jasper and the family are back! We are excited that we have been able to bring these lovely carvings back to the store. We have also introduced the Happy Buddha statue back to the store along with a few other items from Indonesia. Drop in and get reaquainted. See you soon! Labour Day weekend can be the start to new life moments including school, jobs and for some retirement. We often leave the best things to last so be sure to check your supplies to ensure that you have enough coffee, Giddy Yo Yo and items to cozy your living or work space. Come and see what the world of Fair Trade has to offer! Coffee farmers and co-op members of the Li Maya Coffee Farmers Co-op, plus former Planet Bean barista, Cynthia are pictured here. The two Victors (Victor Lopez, Victor Manuel) from the co-op spent a month with us learning about roasting, cafe development, marketing and wholesale sales. They returned to their co-op in Chiapas, Mexico creating more value for the farmers by developing local business for their coffee. We are very happy to continue to purchase their excellent coffee. I am from a small village called Santo Domingo. There were about 40 families who grew coffee there when I was a child. My father Domingo was a coffee farmer. I would help with the coffee. Picking, carrying, washing, drying, and sorting. It was hard work for not so much pay. In 1996 my father gathered farmers from the village and other villages to form a co-operative union. Today the co-op has 315 members from 21 villages. There are four indigenous groups who live in this area. I am from the Maya Tsotsil group. When I was 12 years old I left the village to go to the City to learn Spanish and go to school. I was alone and had to work all the time when I was not going to school. In 1997 I joined my father to help with the organizing of the coffee union. The purpose of forming the union was to help our farmers get a better price for their coffee. Our coffee is certified organic. We have our own Fairtrade certification. Whimsy can be anything that is fanciful or odd. What could be more whimsical than soapstone animals such as the hippo, elephant , owl or cat. Hand carved in Kenya often using very primitive carving tools. Banners, also create a feeling of whimsy just by the saying. Drop in and see what other Fairtrade ideas bring out your whimsical nature. Doorway Stars may be just the ideal way to pick up an entrance, frame a wall or bed. These stars are created in Bangladesh by women who are members of the Prokritee Artisans group. This group provides an income to women who live the rural areas, some who may be widowed or divorced. The group also assists their artisans in improving their education and standard of living. The stars are made from keya palm leaves. These leaves are harvested a few leaves from each tree so as not to harm the plant. These leaves are then cut into strips using razors, then soaked in bio degradable dyes that adhere to the leaves and not the waste water. Once dyed they are dried and then woven o make this decoration. Drop in and see them for yourself. Summer time and the dressing is easy. We are excited to offer these very different and comfortable options. The Multiwear Guru skirt made from recycled saris offer you a variety of ways to be worn. The skirts are easy to pack, and cool fitting. The Butterfly dress is from Nepal and made of cotton. It looks great over capris or leggings. The dress can also be worn as a swimsuit coverup. Both options are comfortable and easy summer dressing. When the founding fathers named Orangeville 153 years ago they could not have imagined a slide ride on Broadway to celebrate. They did envision a community that would thrive withthe advent of Theatre Orangeville, the lacrosse programs and basketball that have offered many of students scholarships, the variety of shopping not to mention the quality of the restaurantsavailable in town. Come downtown and celebrate our town's history! Wine, a favourite beverage for some. These lovely wine or water displays are perfect for outdoors. They offer a nestling spot for both a bottle and glasses. Relaxing on your patio has never tasted or looked so good. Drop in and see them . May we suggest these ideas for Host Gifts for those summer cottage stays or BBQ's. Acaica Wood Bowls made in the Philippines by Saffy Handicrafts. Perhaps a lovely basket made from Banana Leaves, Hogala Grass or Kaisa Wildgrass each offering there own style and colour. There are glasses from Bolivia or a unique piece of Soapstone from Kenya. Coffee from Planet Bean in either Beans or Ground is always a favourite and you can never go wrong with Giddy Yo Yo Chocolate. These are just a few suggestions so drop in and see what the world offers. While Sproule's Emporium specializes in Fair Trade products we are also proud to support Canadian Made Products. Cheeky Bee Beeswax Candles, Patio Torches by Décor Pro and Fence Sitters by Garden Envy to name but a few. Drop in and see what these companies have to offer. Father's Day is fast approaching and it can be difficult to know what to gift Dad. May we suggest an eyeglass holder made in India the perfect spot for glasses that continually loose themselves! Coffee in either Bean or Ground is a flavourful choice. Planet Bean offers blends or single origin choices. As we talked about last week a place to relax out amongst the trees. All of these ideas have helped the men work towards different foundations for their families. By earning wages they are able to see improvements in education, health care and life expectancy for themselves and their communities. Come and see what the world has to offer. Father's Day is just days away and the head scratching of what to treat Dad is beginning. May we suggest a hammock. There is nothing more relaxing on a summer afternoon than a nap outdoors. These hammocks have been created in Nicaragua by the Oyanca Artesania. This group was founded by Tamara Pereira whose aim it was and remains to provide opportunities to export Nicaraguan products. The hammocks are woven on simple looms and tied by hand. The artists of the Oyanca live in both rural and urban areas and while it supports a number of men it also supports women who are able to work from home. This allows the women the opportunity to help support their families, earn a living and independence. These hammocks will support up to 115 kg.. Come and see one soon! Just in case you missed them here are our Facebook and Email Postings. Photos of the items talked about can be seen our Products Page or viewed with the postings on Facebook. We hope you enjoy them and we look forward to welcoming you in the store. Summer time and the music is easy. As we enjoy music this weekend in Orangeville drop in and see what instrument inspires you. Perhaps it is the Bajana Drum crafted in West Bengal and Uttar Pradesh, the Pan Flute handcrafted in Peru or the Bamboo Chimes from the Philippines. 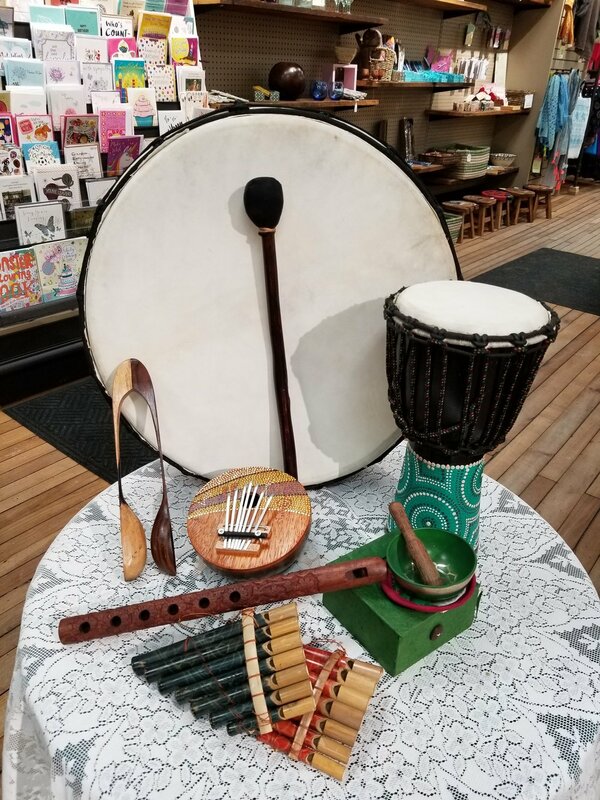 The Bamboo Chime chimes with 18 finely tunes metal pipes, while the Pan Flute offers ten notes and the drum is great to have fun! Rafiki, in Swahili is the word for friend. What better way to tell someone that you are thinking of them than with a gift of Me to We. Each chain offers the opportunity for improved water, health, education or income and the results can be tracked by using the code on the back of each package. The chains are made from Czech glass beads by the Women in Kenya. This exert from the Me to We website highlightssome the of objectives :Me to We is an innovative social enterprise that provides people with better choices for a better world. Me to We measures the bottom line, not by dollars earned but by the number of lives changed and the positive social and environmental impact made. Who does not like a good game of cat and mouse besides the cat or mouse? This Cat and Mouse as well as the Elephant has been created using Kisii soapstone found in Kenya. The initial carvings are done by using a tool known as the panga. After the carving the soapstone is then sandwashed, sun dried and painted. Both men and women work together to create these sculptures. To achieve colour for the sculptures including hearts they are dyed in ink, paint or even shoe polish. Each of the sculptures then have the colour sealed with beeswax and then finished with a good polish. All of the work including the mining for the soapstone is done by hand. Through the efforts and talents of these men and women their families have bee able to go school, enjoy medical care and an overall enhanced quality of life. Come and see our collection. ! Whether you are looking for a place to retreat to comfortably in your favourite tree or to enhance the look of the back deck drop in and what is available. This hammock chair is made by women in Nicaragua and will accommodate up to two hundred and twenty five pounds. The patio, wall or table torches add an ambiance to any outdoor space. For the gardeners in the family a gardening basket, apron or planter basket will be the simple touches. The baskets made in Bangladesh from hogala grass by co-operatives that improve the quality of life of the residents of the country. Come in and see what you need for your garden space. What would our lives be like without our Mother's, Grandmothers or Aunts? For some, this year, Mother's Day will be celebrated for the first time for others the number of times is not to be counted! When thinking of a gift for Mom think Fair Trade. The role of women in many emerging countries is changing and it is important that we support their efforts to improve their lives and those of their families. To that end may we suggest bracelets from India, Purses and Baskets from Bangladesh or Pottery from Vietnam, Chocolate from Orangeville or Coffee from Peru. Drop in and see what the world has to offer! Has there ever been a been truer sentence. As Mother's Day is just a couple of weeks away we cast our minds to gifts to acknowledge our mothers. Each week we talk about the different products that are available and at the heart of the production are the women. The artisan groups that have been formed around the world allow women to contribute to the success of their families and communities in which they live. Drop in see what the world has to offer. From shopping baskets made from Hogala leaves, Me to We Rafiki bracelets made in Kenya, Vietnamese pottery and let us not forget the Café Femenino Coffee by Planet Bean (produced by a Women's Co-Operative in Peru) and of course Giddy Yo Yo crfeated here in Orangeville from Ecuadorian Chocolate. is ideal to add colour to a table, hold dry fruit or anything you can think of. Created from the Raffia palm, which is a spectacular tropical palm found throughout East Africa and Madagascar. The leaves of this tree are some of the largest in the plant kingdom. The leaf stocks provide a strong, flexible fibre that can be woven in to baskets. The National Association of Women's Organizations in Uganda (NAWOU) works with over 1000 women's groups in Uganada with the goal seeing a strong women's body equipped with the knowledge and skills to make women self-reliant. Many of the members of these groups are infected with HIV/Aids and the income from the production of these baskets provides much needed income. The NAWOU group lobbies the government on health concerns, economic development and other areas that are of concern to women. Some of its members have been elected to local and national parliaments. This basket is a great choice for shopping at the Farmers' Market. Complete with leather handles and a zippered lining it will keep any shopping safe, secure and dry. Handcrafted in Bangladesh using hogla grass harvested from trees found in the mangroves and tidal forests of coastal belts. The leaves of the plant are excellent to weave,when a little wet will braid easily and once dried are very strong. Different parts of the Hogla plant provide different looks to the weaving. The group that crafts these baskets empowers women a feat not embraced in Bangladesh however Dhaka Handicrafts has found a compromise by bringing the work to the women. This allows them to stay with their families and contribute to the success of future generations. Drop in to see this and other baskets. Enjoy this glassware made from recycled glass, crafted in the area of Cochabamba located in the Bolivian Highlands. These glasses have been mouth blown using all recycled glass and as a result creates the bubbling making each glass unique. The water jug with its own glass is an ideal asset to any office or bedside table. Crisil Srl is a family business in Cochamba, Bolivia. This business is able to employ residents of the area who have difficulty finding employment. Crisil, uses recycled glass which is gathered from local garbage. The glass is then sorted, cleaned and melted to create these out of the ordinary products. The employees are given the opportunity to learn the skills to produce these works. Easter is almost here and our thoughts turn to spring and all the wonders that this season offers. In addition to chocolate for Easter Baskets may we suggest Hacky Sacs, Spinning Tops, lovely young girl necklace and bracelet sets. Let us not forget the tasty Giddy Yo Yo Chocolate and Planet Bean Coffee. All of these items have been made by artisans who are working to improve the quality of the lives of themselves and their families. Drop and see what the world offers! Easter celebrations are just a few weeks away and we are very excited to introduce these treasures handcrafted by the artists of the MAI Vietnamese Handicrafts. These pieces are created out of old magazines and newspapers. The paper is sorted into colours which are then worked into tightly rolled tubes around umbrella spokes. The finished tubes are coiled and glued into spirals to created not only these lovely baskets but also trivets and placemats. These items are treated with a starch solution that protects the paper from heat and water. Come in and see them. March Madness has arrived and it is not basketball! As we make the transition from winter to spring we are excited about the new items in the store. Whether you are looking for shower or perhaps wedding gift or spring pick me up drop in and see what is new. These are just a couple of photos of new items. Outdoor torch lights, great new jewellery pieces, colourful infinity scarves and butterfly dresses! Come and share the madness. There is nothing like a hot beverage to take the chill off! We have a selection of Teas, Did you know that Green Tea is known to reduce fatigue and increase concentration? It is the perfect choice to enjoy with friends. Roobios Tea, an afternoon favourite, offered by Four o'clock is crafted from the rooibos shrub in South Africa. In addition to being caffeine-free it is also low in tannins, rich in antioxidants and minerals. These are just two of the teas available. Why not come and make your choice. A greeting card for any occasion can bring a smile, rekindle a memory or create a new memories. Drop in and see our selection designed by local card artist Ashley Taylor. We also offer a variety of other cards including those that are plantable. Gifts for Valentine's are always appreciated and to add our recommendations for this celebration we recommend the Multiwear Skirts, great for the winter getaways, a lovely chenille poncho or a lovely piece of jewellery. By purchasing Fair Trade you contribute to the improvement in the lives of families be through education, health care and business skills. Drop in and see our selection. What better way to celebrate Family Day! Valentine's is great boost to winter offering some fun by encouraging you to show a special someone that you are thinking of them. Your thoughts may be shown through a Greeting Card, the gift of warmth, be it an alpaca scarf, mitts or a favourite Planet Bean Coffee or tea, a beewax candle, it may be a piece of jewellery or a Giddy Yo Yo Chocolate Bar. Whatever you choose your choices do make a difference to the lives of others. Families are able to send their children to school, enjoy improved healthcare and learn to become self sufficient. Drop in see for yourself. Yes, Valentine's Day is just around the corner and it is time to gift that special someone. May we suggest a soapstone heart, a Me to We Rafiki Bracelet, a necklace or beeswax candles. We have a selection of greeting cards just right for the occasion. Come in and make your choice! Packing for any vacation can be a challenge. May we suggest this lovely Multiwear Skirt. The design of these skirts can provide you with one hundred ways it can be worn. Made from recycled saris they do not take up a lot of luggage space, they wash and dry quickly and can go from day to night just by reversing the skirt! They may also be worn as dresses or a beach cover up. How ever you choose to wear yours they are extremely comfortable. Come in and see one! When the temperature drops there is nothing like a great cup of Hot Chocolate either on its own or with a touch of a spirit of your choice. Did you know that the Camino brand is a Canadian based company that was established in 1999 by the La Siembra Co-Operative. This group was one of the initial importers of Fairtrade certified cocoa and sugar in North America. Through their hard work they today work with approximately 18 producer co-ops who in turn support approximately 36,000 family farmers in 9 counties. That is just one reason why Camino was named Trader of the Year for 2015 by the Fairtrade organization. The second reason is it tastes just fantastic is gluten free. Come in and get yours! May we suggest these items for that hard to gift person. There are Cheeky Bee Beeswax Candles, a tree ornament, beautiful Alpaca Wool Scarves, Chenille Cotton Ponchos, Warm Mitts made from sweaters not to mention jewellery, fence sitters, garden flowers, Memory Paintings by Mary Scattergood, toys, Me to We Rafiki Bracelets inspired yet? Drop in and see what is available. The Office Secret Santa gift can be a difficult choice. May we then suggest... Beeswax Candles, a Seasonal Ornament, a selection of Giddy Yo Yo Chocolate , Mary Scattergood Notecards, a piece of jewellery or for those who enjoy a good cup of coffee Planet Bean either ground or bean. Stocking Stuffers of the Me to We Rafiki Bracelets. Yo Yo's, Wood Puzzles and Mazes offer a just a few suggestions. Marigold's Toys has some really fun bathtub creatures, small puzzles along with farm animals. Come in and see what other ideas may inspire you! Jewellery is always a favourite gift. This year consider these bracelets. The multicoloured bracelet is made from orange peels. The peels are collected from juice vendors and by being creative, using natural dyes the peels are then crafted into bracelets. Additionally, we are excited to feature bracelets created by Trinity Jewellery Crafts. Trinity Jewellery is a small business located on the edge of the Dandora slums in Nairobi Kenya. This group supports the training and education of Kenyans ably assisted by Joseph Muchina who creates the designs. These bracelets are made from wire and silver plated metals. The designs find their inspiration routed in traditional African jewellery. Come in and see them . We have talked about the Rafiki bracelets or chains on different occasions. We are very excited to let you know that a collection of bracelets has just arrived that are suited to the Festive Season. You can give someone Frozen or Sweet Treats which will give clean water, Fruitcake that gives health care or Secret Santa that gives education. Rafiki is the word for friend in Swahili and they are made by women in Kenya. Through your support of the Me to We Rafiki program lives have been impacted and the results can be seen by viewing the code on the back of the package. Drop in and see them! Join us the for Grand Opening of Marigold's Toys, Saturday November 7 2015 1:30 p.m. to 2:30 p.m.. Exciting Door Prizes! They are back! We are excited to see the return of the labrynith puzzle and the eyeglass holder as well as the puzzle boxes. These items are being crafted in India by the Asha Handicraft Association. This association has and continues to encourage the growth of cottage industries while changing the lives of those less fortunate. Today, the benefits that the artisans receive include marketing, design ideas, interest free loans, medical care and education to name but a few. Education is provided to families on a vast number of topics including financial planning. The Asha association also promotes and empowers women. Drop in and see them! There is nothing scary about alpaca. Did you know that alpaca wool is hypoallergenic, the wool does not contain lanolin and as a result is suitable for asthma sufferers. Alpaca wool, like wool from sheep is a natural fiber however, the alpaca is stronger. Additionally alpaca wool also offers temperature control. The time honoured art of weaving and the production of scarves, shawls and wraps has improved the quality of life for many families and villages in Ecuador. Come in and see them! We are very excited to let you know that a variety of felt finger puppets have arrived. Created from felt in Nepal there is no limit to what stories the imagination can create. Our selection of puppets range from birds, farm animals and ocean creatures. Additionally, to the finger puppets we have a variety of hand puppets created from cotton. The work done by Hamro Village to support the creative artisans ensures that many families have food on their table and that their children are being educated. Come in and see them and start creating your own stories. As you will have seen on the fashion runways ponchos are making a comeback. We are excited to have added these to our collection of Fair Trade products. The ponchos are make of chenille cotton in Nicaragua. Casa Relief is an organization headed by Suzanne Campbell that works year round to improve the education and the quality of water(to name but a few projects) available to the people of Nicaragua. It has just been announced that this year they are launching their most ambitious project to date the building of a Community Centre. The aim of this centre is to provide a safe place for people to learn both with books and life skills. Drop and see what good you can do. As Thanksgiving approaches we start to look for the unique touches. Why not beeswax candles? We are pleased to offer you a selection from the Cheeky Bee Candle Company. Did you know that Cheeky Bee started in 1999, that beeswax is a renewable resource, burns with a sweet subtle scent, provides a warm soft glow which is excellent for relaxation and are non-toxic and non-allergenic. Each of the candles are hand crafted with each candle being hand poured, dipped and finished. Come in and see them. They are back. The collection of scarves from Guru made from recycled saris. The colours and patterns of the scarves are very exciting. They are featured above with a jersey dress. All of these items are being created in India. The Guru team works closely with the sewers as they select the saris for the scarves and the multiwear skirts. As a result they have been able to teach families how to change their lives. Come in and see collection. We are excited to introduce Suzie blue jewellery into the store. This lovely line of jewelley is all hand crafted in Bali. The founders have established long term relationships with the artisans and their families. All of the craftspeople are being paid a fair wage which allows the artisans to ensure that the educational, medical and life maintenance needs are met and exceeded. Drop in and see their designs. Do you have a favourite animal? We are excited to introduce soapstone giraffes, owls, rhinoceros and of course elephants. These lovely animals along with the hearts are all being hand made in Kenya. The artisans use sandpaper, screwdrivers, hand drills and switchblades to create these unique pieces. Families throughout Kenya have been able to improve their quality of life through the fair trade production and sale of these items. Come in and have a look. We are very excited to introduce this new of jewellery. Kazuri which means " Small and Beautiful" in Swahili was founded by Lady Susan Wood (1918-2005) with two local women in her backyard. Now, Kazuri employs 350 women where they handmake and paint these jewels. The factory where these brilliant jewels are created is low located on the estate of Karen Von Blixen who is known from the classic film " Out of Africa". The mission of Kazuri is to provide and sustain employment opportunities for disadvantaged members of Kenyan Society. Come and see these beads! As we start to cast our mind to a change in the offerings in our gardens why not think of a lovely pre-rusted flower. They add a lot of personality to any garden. There is also a collection of pre-rusted trees that also enhances any urn or garden. Come in and take a look! It is that time of year when we celebrate new beginnings. For friends who are venturing off to school why not think of a way to brighten up the"new digs". May we suggest an inspirational banner for a splash of colour, a giraffe for something to talk toandwill always give you the right answer or a piece of Haitian metal art. If you are looking for something more sentimental a soapstone heart or a rafiki chain are ideal. Come in and see what will look good. Do not forget to stock up on your coffee or chocolate. See you soon! What other piece of clothing can you buy and wear over a hundred different ways? There are not many however, the Guru Multiwear skirt is one. These skirts are made from recycled saris and offer a variety of colours and patterns. If the skirt is not your style try one the scarves. Guru also offers dresses, pants for you to enjoy. Drop in a see what is available. Me to We is part of a family of organizations that has a shared goal of shifting mind sets from "me" to "we". Participants in We Day celebrations are based on actions not just buying a ticket and by engaging over 160,000 students in 4000 schools across Canada, the USA and the United Kingdom it is making a difference. This organization has also had a positive impact on building schools, improving healthcare and teaching women economic self sufficiency. We are proud to carry the Rafiki chains that are being created by women in Kenya. Each of these chains provides support to a variety of needs be it water, health, education and the results of your purchase can be tracked. A rafiki chain is a great way to show someone you that you are thinking of them. We are pleased to introduce Crystal McMaster jewellery to our store. Crystal has been designing and creating unique high quality jewellery pieces since 2005. The passion that she has for art and design provided her with inspiration and the initiative to start her own studio. Her designs are known for being modern, one-of-a-kind while still infusing elements of classic design. Drop in and see her collection of earrings and necklaces. It is not always easy deciding what to give as a wedding gift. The gift of a Soapstone Lover's Knot or a Dancing Couple is a lovely accent to any gift. These are unique pieces crafted in Kenya. They require a lot of patience to create and something that is something that can be in short supply however, for many of our world crafts people they have this in abundance. The artisans come from the rural villages in Kenya. The residents of this area have formed the SMOLArt group which specializes in Soapstone Carving. The soapstone is mined from the pits in the surrounding area of Kiisi and the western parts of Kenya. Then by using tools such as screwdrivers, hand drill and switchblades they are able to craft such wonders as the Lover's Knot as shown above, Hippos, Plates to name but a small few items. The results of their efforts have improved not only their living conditions but their education and health. Time honoured traditions are being preserved by your support of Fair Trade. As the region is proud to celebrate all things equestrian let us not forget some of the many other animal wonders. Craftspeople from around the world work diligently to produce replicas of giraffes, zebras, birds, elephants to name but a few and are created by hand from wood, soapstone, oil drums. The detail and the patience that is necessary to produce these wonders is incredible. Time honoured traditions are being preserved by your support of Fair Trade. Come in and start your own collection. It is always exciting when the organizations and suppliers we do business provide with updates on their efforts. One such organization, Casa Relief has done just that by showing us how they assisted children in El Raison school. They were able to paint the school, take the children shopping, fix chairs and provide some environmental advice. Additionally, six families were able to receive water barrels to hold water between deliveries. Congratulations to Casa Relief for improving these lives! Hmm, should I try a new blend of coffee or stay with what I know? What coffee is best served at the end of a great dinner? If these are questions that you have asked yourself then come in. Saturday, June 27, between 9:30 a.m. and Noon and ask Rufus Cavan. Rufus, a member of the Coffee Roasting Team at Planet Bean will be in the store and offering tastes of some of the Planet Bean Roasts and can make recommendations to you. As a graduate of the Q-Grader Coffee Institute in Montreal he is wealth of knowledge about everything coffee. He may even have the perfect recipe for Ice Coffee! Fair Trade has helped to improve the quality of life offered to Father's in countries less fortunate. The introduction of the Fair Trade Principles ensure that fair wages are being paid in return and that working conditions are safe. This results in families enjoying improved education, health care and living conditions to name but a few. This Father's Day Weekend think of giving Dad the gift of Planet Bean Fair Trade Coffee , Giddy Yo Yo Chocolate and yes, even the hammock as we all need to rest and recharge. What ever you do to celebrate with your Father enjoy and know that buying Fair Trade has helped another father. Father's Day is on our door step and what would Dad like? Why not think of a hammock, what better place to relax and watch the world go by? In the Yucatan of Mexico a Mayan hammock has been used as important piece of furniture either outdoor or indoors, for resting and relaxation. A Mayan hammock is soft yet it provides support. The Mayan hammocks available in the store are created using centuries old methods and are 100% cotton hand crafted by the Mayan women of the Yucatan. The Mayan women use the money they have earned by creating this magnificent hammocks to support their families and the advancement of their communities. Come in for Dad's ! Music is a universal language that convey a variety of emotion. It is often said that communities would "talk" to each other through the use of drums. The djembe drum shown is rope-tuned goblet drum that is often played with bare-hands. The djembe drum is a very versatile drum and is able to produce a variety of sounds. This type of drum is very loud which allows it to be heard clearly as a solo instrument. The interesting fact about this drum is that it is usually played only by men. We have a few of these drums in the store. When downtown this weekend for the Blues & Jazz drop in! It is once again that time of the year when we think about "Appreciation" Gifts for those leaders who have given their time to teach. This could be in sports, theatre, art or the classroom. Why not think of a Fair Trade Gift. Drop in a see our selection of Crystal McMaster Jewellery, as you read last week Planet Bean Coffee, Haitian Metal Art to outline but a few ideas. Drop in and be inspired . Fair Trade Gift also are great Wedding Gifts for that hard to buy for couple! Did you know that Planet Bean began roasting coffee in Guelph in 1997. From the very beginning the focus for the coffee has been certified fair trade and organic gourmet Arabia coffee. Planet Bean now offers approximately 13 different roasts including single origin or blends. We have a majority of them available at Sproule's in both the bean and ground formats. The Roaster's of the Planet Bean coffees are members of the Roasting Guild which includes some of the world's finest roasters. The Roasting Guild provides the opportunity for like minded Roasters to share their experience, knowledge and skills. We are fortunate that Planet Bean roasts in small batches and ships immediately. Coffee roasted on Monday is in our shop by Thursday this allows us to continually have only the freshest coffee for you! Come in and make your selection. It is once again that time of year when we celebrate the success of our family members and friends as they complete an important chapter in their lives. To commemorate the occasion think about a gift that also assists other achieve their goals. Haitian Metal Art, Soap Stone Knots, Mosaic Plates, Giraffes (in all sizes), a Memory Painting by Mary Scattergood are just a few suggestions and so many others in the store. Hurray, Hurray it is Mother's Day. Did you know that by shopping Fair Trade you are changing lives. That is what Fair Trade Day celebrates also. Products that carry a Fair Trade label have rigorous protocols that must be met or exceeded. Some of the protocols include the artisan being paid a fair wage and working in a safe environment. Come in see what the world has to offer perhaps it is a piece of jewellery from the the Me To We Collection, Planet Bean Coffee, Giddy Yo Yo Chocolate, a Guru Scarf or a piece of Haitian Metal Art to name but few ideas. As Mother's Day approaches think about giving the gift of Fair Trade. Mother's in many instances are the driving force for the creation, training and long term growth of there products. It is through the support of Fair Trade that they are able to improve the quality of life that their children enjoy be that through better education, food and medical care. Drop in and see what is available it could be jewellery, pottery, clothing, scarves, coffee, chocolate to name but a few items. As our fences become visible again we will soon cast our minds to our gardens and how nice we can make them. Our collection of Fence Sitters includes the Blue Jay, Cardinal, Robins in addition to the Owl, Squirrel and Cats! Garden Envy also has a complement of pre-rusted flowers and garden stakes that make interesting and decorative additions to any garden. Drop in and see our collection. At Sproule's we are excited to introduce the Infinity Scarf by Guru. These lovely scarves are made from recycled saris. Did you know that the word Sari comes from the Sanskrit word that means "strip of cloth" and this then evolved into the word sari in Hindi. These scarves are a creative way to give new life to any outfit. In addition to the scarves we excited to also offer the MultiWear Skirts, Capris, Kimonos and a few select items all designed for comfort and from the recycle saris. Easter is upon us. Now comes the time when we try to find that something fun for the Easter basket. May we suggest a Me to We Rafiki Chain made by Mothers in Kenya, Hacky Saks for the budding juggler or perhaps a puzzle. All this in addition to your favourite Giddy Yo Yo Bar. For a special treat Planet Bean Coffee is also an excellent choice for the Easter Basket or the flavourful end to the family dinner celebrations. Drop in and get inspired. The Kalimba is just one of the instruments available at Sproule's Emporium. Did you know that kalimba is known as a modern day example of an ancient family of African musical instruments. The mbira or a thumb piano is the ancestor to the kalimba. The mbira evolved throughout Africa with each area tuning and modifying the design be it the number of tynes or the type of wood or gourd used to best reflect their music. The kalimba played a different role in the social life of each community. It could be played while tending cattle, riding the bus or to celebrate events such as weddings or to accompany singing. In some areas they were even used to attract the spirits of ancestors to that their advice could be heard. The Global Mamas Women's group is just one of many success stories that can be told when thinking of Fair Trade and International Women's Day. Skills such as sewing, beadwork, knitting that have been passed down through the generations now are able to provide support to families and improve the quality of life available to entire villages. Women have been given the tools to learn how to run their own business and develop ways to sell their product to international locations. Through the support of Fair Trade lives are being changed. Opportunities such as going to school or learning a trade that were thought to be unavailable are now a reality. Drop in and see a difference you can make! A card or a note can go a long way to picking up ones spirits. While emails are an easy way to stay in touch a handwritten note shows that you have taken the extra time and effort to say that you are thinking of them. We offer a variety of cards suited to just such a purpose. Some are plantable which gives an added bonus. others are blank which allows you to create your own message and some have a few lines just to get you started on your thoughts. What ever your need drop in a see our collection. Easter is just around the corner. It is the time of year when we look at our wardrobe and say enough! We are excited to introduce these chenille ponchos from Nicaragua. We also have cotton tops for both adults and children. Scarves are quick way to pick up any ensemble. We are also pleased to offer t-shirts designed in Canada to support the environment. Come in see what is new! Shop Fair Trade it feels good! Me to We as we often written does great work in supporting the women of Kenya. Did you know that your support of their products has provided employment to over 1000 women. It has allowed the families to have roofs on their homes, start gardens and send their children to school. The impact of your support of their Rafiki Chains can be tracked by using the code on the back of the package. It really does feel good to help others. May we suggest that for your Valentine shopping a gift made with heart. We offer the Warm Heart mittens made from recycled sweaters, jewellery including the Me to We Collection of Rafiki Chains, scarves made from alpaca wool or recycled saries, soapstone hearts, Cheeky Bee Beeswax Candles and of course Planet Bean Coffee and Giddy Yo Yo Chocolate. With so much to choose from come in and make your choice. Fishing in the Humber, is just one of the many memory paintings created by Mary Scattergood. We are pleased to offer a selection of Mary's work at the store including the giclees, prints and framed prints. If you have a favourite let us know and in consultation with Mary it can be ordered. Mary has also proven to be a successful author and illustrator of "There are Fairies at the Bottom of Our Garden" and plans are in place for this to become a series. Drop in to see her collection. There is nothing like a hot beverage to take the chill off! We have a selection of Teas, Hot Chocolate and of course Planet Bean Coffee. Did you know that Green Tea is known to reduce fatigue and increase concentration? It is the perfect choice to enjoy with friends. Roobios Tea, an afternoon favourite, offered by Four o'clock is crafted from the rooibos shrub in South Africa. In addition to being caffeine-free it is also low in tannins, rich in antioxidants and minerals. These are just two of the teas available. We offer the Camino Hot Chocolate in both Milk and Dark Chocolate. What better way to watch your favourite TV show than with a great cup of hot chocolate. To complete the winter warm up Planet Bean offers a variety of coffees in your choice of ground or bean in blends or single origin beans. All of these offerings are Fair Trade Certified. We are excited to give you an update on the contributions made this is year by one of our suppliers,Casa Relief. Water filters have been installed in both the school and community in El Raison. Fifty four children were able to go to school on full scholarships and 2 women were able to attend university. 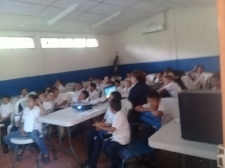 A local school was able to able to see the creation of computer room and have three computers made available! Shopping Fair Trade does make a difference to lives of others. Merry Christmas and all the Very Best of the Season! Planet Bean Coffee...a perfect stocking stuffer! May we suggest....for those last minute gift ideas and the perfect stocking stuffer you can never go wrong with coffee or chocolate or a Rafiki Chain from the Me to We collection. We also have a selection of Haitian Metal Art, Soapstone Elephants and Jewellery and so much more. By shopping Fair Trade you are helping to improve the lives of others. are one-of-a-kind. Some times finding that Secret Santa, Hostess or Thank You Gift can be the most challenging. May we suggest Planet Bean Coffee, they have a variety of roasts that will suit any coffee lovers palate. Giddy Yo Yo has introduced a new flavor, Lemon Lime, their Mint and Orange continue to be a particular favourite and of course Puzzles, Bracelets and Beeswax Candles are other ideas. Should you be looking for a new, creative way to win the "Ugly Sweater Contest" why not think of a Me to We Rafiki Chain. The "Ugly Sweater" Rafiki supplies three pencils to a child in need. What ever you choose you are helping to improve lives. Drop in a see our selection. is the one gifEt that is never a wrong choice. Our selection of bracelets from Mexico are created by the members of Art Camp or Artesanas Campesinas which translated means rural female artistans. The part of Mexico that the members of Art Camp live is Tecalpulco , which has been long been known for the creation of silver and abalone jewellery. The artisans of Camp Art are always looking at new designs, materials and methods of creating their jewellery while still maintaining time honored traditions. Their efforts have continued to provide economic viability for their families. Drop in a see our selection. Saturday, November 29th we ask that you Shop Your Neighbourhood. Orangeville and in particular Broadway has seen many incarnations over the years as we can attest to afterall our location at Sproule's was a drug store for over 100 years. Let it be your first instinct to shop in town to see what is available in your "Neighbourhood". The customer service offered in family owned businesses is personal and by shopping locally you support the economic sustainability of your community. In addition to supporting your community when shopping at Sproule's you are also encouraging and applauding the efforts of those who are less fortunate by shopping FAIR TRADE. We look forward to seeing you Saturday. Is a new product that we are pleased to introduce to Sproule's Emporium. What started with a single handmade bar of soap as its product has now evolved into a full line of soap , bath products and body butters. These quality soap products are produced by hand and offer unique aromas such as Brown Sugar Fig, Coconut Lime Salsa and Apple Clover. These products have been included in the gift baskets for guests at the American Music Awards! The Collins Family work together in the creation of new products. Drop and see these soaps for yourself! Tickets are available in the store! This fantastic event is just nine days away(Saturday November 8th), have you purchased your ticket? When out that night you will have the opportunity to save the tax on your purchases at Sproule's! Many of our finest merchants on Broadway are participating. Come down and enjoy the fun! Patience is what fair trade artisans appear to have in abundance. The SMOLArt artists that live in the rural village of Tabaka, Kenya crafting soapstone exemplify this theory. The soapstone is mined in and around Kiisi, Kenya and once delivered to the carvers it is transformed into Lover's Knots as shown above hippos, hearts, families are but a few creations. The soapstone offers a variety of colours from pink to black. Each piece may then be polished with sandpaper dipped in water to smooth away the rough edges and the carved with African motifs. The tools used to do the carving range from screwdrivers, hand drills to switchblades. We are very pleased to offer a selection of soapstone items. Come in and see them! Did you know that alpaca wool is hypoallergenic, the wool does not contain lanolin and as a result is suitable for asthma sufferers. Alpaca wool, like wool from sheep is a natural fiber however, the alpaca is stronger. Additionally alpaca wool also offers temperature control. The time honoured art of weaving and the production of scarves, shawls and wraps has improved the quality of life for many families and villages in Ecuador. Come in and see them! That time of year has arrived once again when we change up our closet. Drop in in and see our selection of scarves, dresses and skirts, all made from recycled saris. The colours offered in these collections will complement any wardrobe and give any ensemble a new look! There is also a selection of two tone pashminas just right to enhance any evening look. Come in and see them! At Sproule's, we are excited to introduce a line of beeswax candles created by the Cheeky Bee Candle Company. Cheeky Bee Candles was started in 1999 as the result of search for a natural alternative to chemically based toxic candles. These are but a few of the interesting facts about the beauty of beeswax: it is a renewable resource that produces natural light, clean heat; costs pennies an hour to burn; burns with a sweet, subtle honey scent and warm, soft golden glow that are conducive to relaxation; burns completely clean; is non-toxic and non-allergenic. Ideal for those with asthma or allergies. These candles are painstakingly hand crafted with each candle being hand poured, dipped and finished. In fact, the small production area for these candles is completely without any plugged-in equipment. Come in and see them! Tagua Nut Jewellery is one of the new products that we have available at Sproule's. Did you know that the tagua nut,also known as "vegetable ivory" is the dried seedpod of the Tagua Palm Tree which grows in the tropical rainforests of South America. The tagua nut is chemically pure cellulose and prior to maturation contains a milky liquid centre however once it is ripe, falls to the ground, gathered and dried anywhere from four to eight weeks it becomes extremely hard. Once it is hard the families are then able to shape, dye and create many different items including necklaces and bracelets. These products are then brought to market where they are paid fairly and promptly. Come in and see them! As the summer wanes and the trees begin to take on that wonderful fall appearance we cast our minds to exterior fall décor. At Sproule's Emporium we are very excited to introduce a couple of fun planter stakes. a witch and ghost by Garden Envy. They are suitable for both outside and in and will add a touch of whimsy to any display. Come in and see them! The Me to We Collection of Rafiki chains offers the perfect remember- me gift! The very word, Rafiki, means friend in Swahili so what better way to be remembered as you start new life adventures. In addition, to creating a memory, they have the added benefit of providing water, pencils, medical treatment, education and income to hardworking Maasai Mamas in Kenya. The code on the back of the package provides you with the opportunity to see the effect your choice has made. Drop in and see the collection. Any one can go on safari without leaving town. 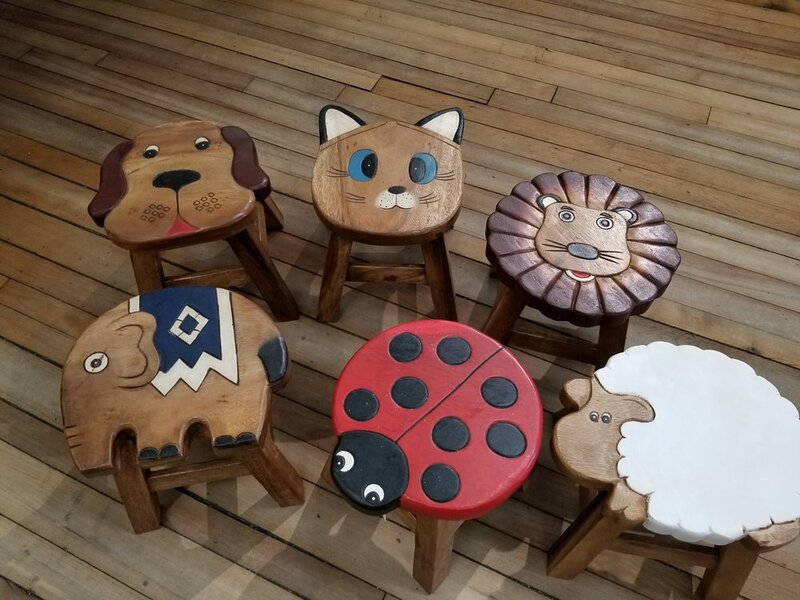 We are pleased to introduce these handpainted stools from Indonesia. They are perfect for the little ones in your life to use, hold a plant or just add that animal feature to a room. In addition to the giraffe and zebra they are available with a turtle, tiger or lady bug! Drop in and see the collection! When a product tells you on the label that, in addition to being free of gluten, nuts, dairy, soy, refined sugar and all other nasty funk, you have no choice, it must be tasted. The crafting of this food, not candy as also clearly stated on the label, starts with Heirloom Equadorian Arriba Nacional cacao. The Giddy Yo Yo team works with the farmers to ensure that the bean is grown in mineral rich soil ,free of chemicals, uses the freshest of water, to name but a few of the qualities: crafted here in Orangeville and is available in a number of flavours. Giddy Yo Yo makes a great finish to a perfect meal, a flavourful souvenir, Thank You Gift and a personal treat! Drop in and choose your favorite bar this weekend! When you see these symbols on Fairtrade products you can be assured that the standards as outlined by Fairtrade International have been met or exceeded. Just a few of the benefits of Fairtrade include stable prices, a fairtrade premium, partnership and the empowerment of farmers and workers. Fairtrade allows all involved to win. We as the consumer have the opportunity to enjoy unique handcrafted products, the families have the opportunity to receive a fair wage for the production of their product which in turn provides opportunities for education, health care and a higher standard of living and one of the last beneficiaries is the environment. Help change a life and shop fairtrade. For anyone who enjoys the Primitive Art Style or Memory Paintings by Mary Scattergood you will be excited to learn that her first book has been published. Based on a song that her Grandmother loved to sing by Beatrice Lillie, Mary, has written this lovely story about Fairies in the Garden. This is the first in what is anticipated will be a series of books. In addition to writing the book Mary has also done all of the illustrations . We are pleased to have signed copies available in the store. Come in and pick up your copy. One of the nicest parts of the Festive Season is receiving cards with news from friends and family. Why wait all year to write a note? A card or a handwritten note are great "pick me ups" when a friend needs them. The picture on a blank card can recreate a shared memory or invoke a good chuckle with only a few words that need to be written. Others provide a starting point to write current news or express a sentiment of congratulations, well wishes, birthday greetings or condolences. Our selection of cards is ideal for this featuring a cross section of occasions some cards are even plantable. It is a personal touch when you take the time to write a card. Come in and chose for yourself. This Easter may we suggest placing your favourite Giddy Yo Yo bar in this lovely basket that has been from strips of recycled magazines and newspapers. The artisans of MAI Vietnamese Handicrafts create these pieces by wrapping the recycled paper around umbrella spokes. The resulting tubes are then glued into spirals creating not only Easter Baskets and Eggs but also trivets,placemats and bowls. To ensure the longevity of these pieces they are dipped in a starch solution. The artisans of the MAI group have enjoyed access to better education and healthcare. The wallet charms and the charm bowls from Basic Spirit are also a lovely addition to any Easter gift.